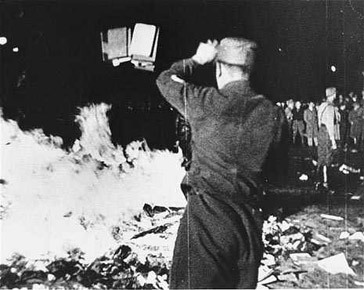 As part of an effort to align German arts and culture with Nazi ideas (Gleichschaltung), university students in college towns across Germany burned thousands of books they considered to be “un-German,” heralding an era of state censorship and cultural control. Students threw books pillaged mostly from public and university libraries onto bonfires with great ceremony, band-playing, and so-called “fire oaths.” The students sought to purify German literature of “foreign,” especially Jewish, and other immoral influences. Among the authors whose works were burned was Helen Keller, an American whose belief in social justice encouraged her to champion disabled persons, pacifism, improved conditions for industrial workers, and women’s voting rights. Now, once again Marxist based Fascism is rearing its ugly head, as it revives the Nazi book burning efforts, but this time as ‘part of an effort to align American arts and culture with now radically based Marxist based Fascism, which the Democrat Party has now embraced wholeheartedly! However, this time instead of university students in college towns across Germany burning thousands of books they considered to be “un-German,” American corporations are either refusing to publish, distribute, or digitally burning Conservative authored books, in their attempt to herald an era of state censorship and cultural control in America! Left-wing journalists and activists are applying pressure to Amazon and other companies to purge not only right-wing extremist works from their shelves and digital libraries, but they are now shifting towards more mainstream works, in their effort to push the Marxist ideology throughout Universities and across the nation, from sea to shining sea! In fact, one of the most recent books banned by Amazon includes a book co-authored by English Islam critic and independent commentator Tommy Robinson. It is a frightening revelation, as Amazon alone accounts for nearly 50% of physical book sales, and 83% of e-book sales, making a massive dent in Conservative authors ability to make money, or reach readers! And even before that, Amazon had watered down it’s commitment to “the right of every individual to make their own purchasing decisions.” In 2015, the site banned the sale of all merchandise depicting the Confederate flag. Therefore, America, like much of the whole of Europe now, has wholeheartedly embraced the Marxist based Fascism ideal of censorship through book burning and book banning! Now, we can only hope that the radical left can be stopped from burning either of the two most important documents in America…The United States Constitution, and the Bible itself!